Sparkler exits are always great fun and this sparkler exit at Stone Manor was no exception. This anything but typical Malibu wedding ended with the bride and groom driving away in this huge vintage blue Cadillac. But before they left, the guests wanted to give them a sparkler sendoff. And this is one example of a sparkler exit that is pretty amazing. From a technical perspective, this was an extremely hard photograph to capture correctly. I'd actually already finished my required coverage hours and had packed up my gear to leave. But when I saw what was about to happen, I wanted to give a special gift to this bride and groom of my photography. To help put this in perspective, this scene was absolutely pitch black dark. 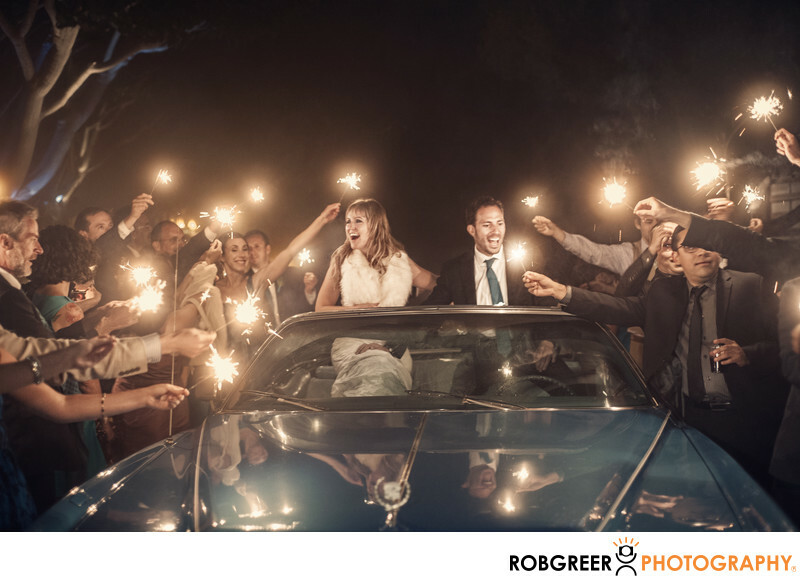 And although the image looks particularly bright here, the sparklers were the only light source and as other photographers can attest, they don't have particularly great lighting characteristics. Also, the total number of sparklers lit at one time was at its highest when this photograph was captured. Three seconds before and three seconds after the shot, the scene was much, much darker. Also complicating matters was the fact that because it was so dark, it was extremely hard to focus even with the top-of-the-line Nikon camera at that time. And so to create this photo, several things had to align it one time including the number of sparklers present, my position in relation to the couple, my ability to focus on the couple, and finally, and most importantly, the expression of the couple. The only light that I used for this photo was the light from the sparklers themselves — no flash photography was used. 1/40; f/2.8; ISO 3200; 50.0 mm.